Starting at 1 pm Brannigan’s Irish Pub [101 E. Center St.] will have live music with the Highlander Bag Pipes and the party & live music continues all day in the bar and in a heated tent in their parking lot. All Irish beers are on special, there will be poster and t-shirt give-a-ways and a green bikini contest starting at 9 pm. Get your green on and follow the end of the rainbow down to Scotty’s Bar [2205 US Hwy 93 S. ] for a chance to win $100 in “gold” coin! The O’Connell Band starts the party up again at 9:30 PM. Give-a-ways & games plus no cover charge. Shuttle service from Brannigan’s Irish Pub to Scotty’s Bar will start at 10 PM and will also be available for sober rides home. The Ancient Order of the Hibernians and the Kalispell Chamber of Commerce are sponsoring a St. Patrick’s Day parade starting at 4 pm moving north on Main Street through downtown Kalispell for some family-friendly Irish fun. Casey’s Bar [101 Central Ave.] will be having an all-day Irish Celebration starting at 11am – Corned Beef will be on the menu as well as green beer and a “green-drink” special [what that green drink is, is TBA – but I’m guessing it’s not for ‘light weights’]. 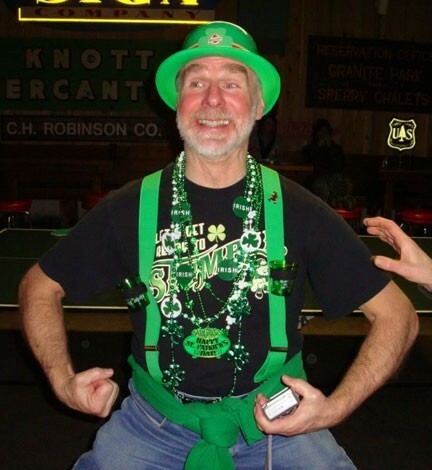 “Paddy O’Bear” will be playing Celtic tunes from 2-6 pm. Local favorite watering hole, the Great Northern Bar [27 Central Ave.] will have live Celtic music by McGrin and O’Bear It from 6:30 – 8:30 pm followed by music by 20 Grand. The Great Northern Brewery [2 Central Ave.] presents “Tim’s Kitchen Takeover” all day – where caterer extraordinaire Tim Good of Cuisine Machine Catering will be presenting Irish food for foodies. They will also be introducing their Nitro Tap at the Draft House. What’s a Nitro Tap? Go and find out! The Boat Club Lounge [1380 Wisconsin Ave.] will celebrate St. Patrick’s Day with local musician John Dunnigan from 6-9 pm and feature food specials of Corned Beef & Cabbage Spring Rolls & Irish Nachos. If you’re up at the Whitefish Mountain Resort skiing , watch some amazing boardercross action at the Nate Chute Classic [OK…. so it’s not St. Patrick’s Day related, but it’s still fun!] It’s one of the biggest boardercross events in the NW with about 125 riders competing for the title and cool trophies. 2 to 5 riders race through a great course consisting of jumps, banks, rollers and traffic. More info at 887-SKI-FISH. And… remember designate a driver or call a taxi and don’t forget to wear green!